Fly Like An Eagle !! This post isn’t a tribute to the incredible Steve Miller Band, but I may have to do that at a later time !! No, this week I’m straying from the world of HR to pay tribute to my son, Josh. My son became an Eagle Scout on Tuesday !! There really aren’t words that capture how proud I am of him. He has been in Scouts for almost 12 years and I was fortunate enough to travel along with him. It’s hard to picture that the little first grader who started as a Tiger Cub Scout is now a young man who will surely change the world !! There are so many things that I love about Josh which made his Scouting experience unique and singular. My son is a free thinker who looks at the world as if it were an endless landscape. He took merit badges that others didn’t because he wanted to track things that interested him. He was disappointed that he wasn’t able to get the Truck Transportation badge before reaching Eagle. He really wanted to do this !! Josh is smart, creative and has a sharp sense of humor. He often encouraged the other scouts in the Troop to look at things differently and try different experiences. He’s becoming a confident speaker in front of his peers and in front of crowds. It’s great to see him continue to develop and grow. He didn’t settle on his project either. He wanted to do something that made an impact and would help many, so he decided to build a 12′ x 12′ shed for a local Animal Shelter. It was the largest project anyone in the Troop has ever attempted. 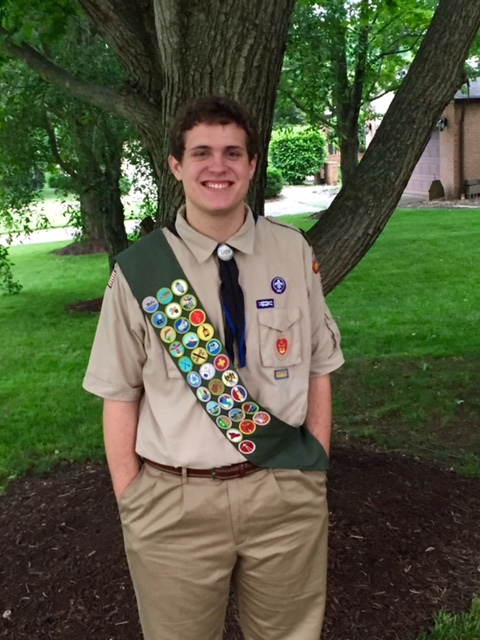 He not only was successful, with the help of many of our scouts and adults from the Troop, but he also raised the most money ever for an Eagle Scout project. I’m not surprised that Josh wanted to “go big” because that’s how he sees life. He faced a challenge that most Scouts don’t face while they work their way through ranks. His Dad was the Scoutmaster of the Troop at the same time he was moving up. Josh and I are very close. He would deny that if you asked him because our personalities are so similar. At times we are oil and water, but that never stood in his way. I can proudly say that Josh was able to develop relationships and become a strong individual even with me in the Scoutmaster role. The other thing that I just have to say for him and about him (because we’ve talked about this) is that my son is a great example of why we shouldn’t stereotype and generalize his generation !! He is a fierce millennial and hates it when my generation (and others) say things about how his generation won’t be successful. Did you know that only 4% of boys who start scouting become an Eagle Scout? His accomplishment has absolutely nothing to do with his age, and everything to do with his character and work ethic !! He’s about to literally “fly” from our house as he heads to college in the Fall. It won’t be the same to not have him here to go to weekly Troop meetings on Monday night or go on another camping adventure or a national event like going with him to Sea Base. He’s not set on a firm major yet in college, but I have no doubt that he will be successful in all he does just like he was in earning this honor. I can’t wait to see what he will do and who he will become. It will be an adventure I’m sure !! Oh, yeah. I needed to close with this . . . Author Steve Browne (Admin)Posted on July 9, 2015 Categories Leadership, Random ThoughtsTags Boy Scouts, Eagle Scouts, Family, HR, Leadership, Life, Scouts1 Comment on Fly Like An Eagle ! !